Dive into Hanoi's pulsating city streets, and you'll capture the essence of Vietnamese life. The country's capital is a burgeoning economic center that still clings strongly to traditional culture, managing to be a showcase of both old and modern Vietnam. The old quarter district hums with street vendor action; the cafés and restaurants are vibrant, contemporary scenes; and just trying to cross a road here can end up being an adrenaline-fueled escapade. When the crowds begin to wear you down, Hanoi has a bundle of sites where you can escape for some peace. Hoan Kiem Lake is a relaxing respite right within the city, while the Temple of Literature and Vietnam Museum of Ethnology provide plenty of opportunities to reflect on Vietnam's grand history. For many visitors to Vietnam's capital, the major attraction is strolling the streets of the city's ancient core. This labyrinthine quarter of narrow alleys is the commercial heartbeat of town and has a history that stretches back 1,000 years. It's a delightfully dilapidated place, where the odd piece of medieval era architecture has managed to cling on within the modern hubbub of whizzing motorbikes, street vendors, and pulsating commerce. If you look up while you're wandering, the area has plenty of vernacular shophouse architecture, where merchants would traditionally live above their shops in very long but narrow two-storey dwellings, squeezed together on the alleyway rows. 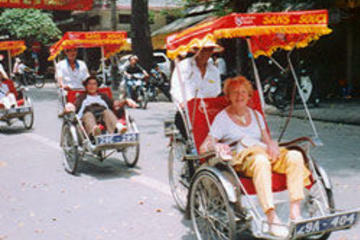 The backstreets here are a great opportunity to soak up the buzz of Hanoi street life. As well as there being plenty of street food on offer and lots of pavement vendors selling fruits and vegetables, there are also stalls selling traditional medicines and Buddhist religious trappings. A relic of French Colonial rule, right in the heart of the old town quarter, St. Joseph's Cathedral (Nha Tho Street) was built in 1886 and is a fine example of neo-Gothic architectural style. The façade is intricately decorated, with two bell towers, while inside are some delicate stained glass window details. The main entrance is kept locked except for mass. At other times, you can access the interior of the church from the back through the offices for the Diocese of Hanoi. Hanoi's most well-known landmark is tranquil Hoan Kiem Lake, nestled just on the southern edge of the old town quarter. The major tourist attraction upon the lake is the small island (reached by a red bridge) that holds Ngoc Son Temple, dedicated to three grand figures from Vietnamese history: La To (revered as a patron saint of physicians); the renowned scholar Van Xuong; and the 13th-century general Tran Hung Dao, who fought against the invading Mongol army. Another tiny island on the southern section of the lake holds the stocky Turtle Tower - best viewed from the bridge. The city's most interesting religious building is this beautiful and incredibly peaceful Confucian temple, originally built as a university in the 11th century. Today, the Temple of Literature stands as a tribute to the nation's scholars. It was here, in the medieval era, that the philosophy of Confucianism and literature was taught, and near the entranceway, you can still see the names of students who studied here, etched into a series of pillars. Inside, a series of manicured gardens lead to pavilions and a well-preserved pagoda where a statue of Confucius sits. A place of pilgrimage for many Vietnamese, the Ho Chi Minh Mausoleum is a sprawling complex set within the city's gardens that contains the tomb of Ho Chi Minh as well as various museums and monuments. The actual mausoleum itself is an austere marble building where Ho Chi Minh's embalmed body sits in a glass case. Also within the complex is the Ho Chi Minh Museum, which has an eclectic collection containing Ho Chi Minh's personal memorabilia as well as plenty of information on the history of the Vietnamese Revolution. Also worth a visit is the stilt house, once home to Ho Chi Minh, which is excellently preserved, and the One Pillar Pagoda. This pagoda is a reconstruction of the original 11th-century temple, which was destroyed by French colonial troops. A must for museum fans and history lovers, Hanoi's Vietnam Museum of Ethnology houses the extensive national collection and tells the story of Vietnam's diverse cultures in a series of excellently well-curated exhibits. Here, the huge number of ethnic minorities who call Vietnam home are highlighted with beautiful displays of artifacts and art that showcase wooden carving, metalwork, and traditional costumes. The garden area outside the main building holds some of the most interesting exhibits. Here, you can see the rural dwellings used by different ethnic minorities across Vietnam, as well as the fascinating Giarai tomb. Built by the French colonial government in the late 19th century, Hoa Lo Prison Museum was originally used to harbor Vietnamese revolutionaries and any dissidents of the French rule. For many foreign visitors though, it's better known as the prison where American POWs were held during the Vietnam War. The most famous foreign ex-resident of the prison is John McCain. The prison grounds contain the communal jail cells, solitary cells, and courtyard, and the guillotine used by the French is also on display. There is a plethora of information here on Vietnam's long battle against France's colonial rule that details the brutal regime prisoners here were kept under. Two rooms also tell the story of the American POWs held here, with a video documenting their imprisonment and eventual release along with personal mementos of the prisoners. Hanoi's water puppet shows are a great way to sample traditional Vietnamese artistry and entertainment and are an excellent evening activity if you have children in tow. This ancient art form first evolved in Vietnam's rural areas during the months of the monsoon paddy field flooding, and today, it is now mostly performed in custom-made water pools rather than outside. Performances usually center around well-known local legends and are accompanied by a live band using traditional Vietnamese instruments. Hanoi is the heartland of contemporary water puppet theater with five shows daily at the Municipal Water Puppet Theatre. The courtyard outside this museum displays an eclectic mix of weaponry and military machines including downed French and US planes, tanks, and a Soviet MiG fighter plane. Inside the actual building is a huge amount of information on the wars with both France and the USA, along with exhibits of weaponry, which will be of interest to those with a penchant for Vietnam's 20th-century history. For the average visitor though, the displays and information panels are not particularly well set out, and many find the museum most worth a look for its courtyard clutter of planes around a stocky flag tower. Art lovers and museum fans definitely need to make a pit stop at this museum that holds a collection of Vietnamese artistry from the prehistoric age right up to the country's contemporary artists. Some of the treasures on display here include terracotta and stone sculptures dating from the Tran Dynasty and Champa Dynasty, Buddha statues from the Mac and Le Dynasties, and the intricate statues of the goddess Guan Yin. There is also an extensive collection of 11th- and 12th-century ceramic work and a substantial gallery devoted to folk art. Although it may not look like much at first, Hanoi's Imperial Citadel area was once the vital seat of military power here, and continued in an important strategic role right up to the 1960s and the Vietnam War. The site achieved UNESCO World Heritage Site recognition in 2010 for its long role in Hanoi's past, and the area's 1,000 years of history are highlighted by archaeological work that has unearthed the foundations of various palaces that once stood on this spot. There's also a bunker here that dates from the Vietnam War where military maps and implements are displayed. 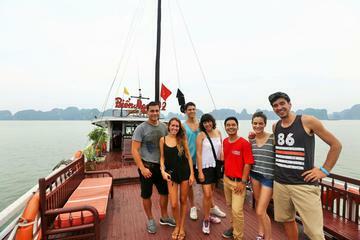 Tay Ho (West Lake) is Hanoi's largest lake, and its shoreline stretches for 15 kilometers. Many locals come here to exercise by walking or cycling the pathway that rings the shore, but there's also two interesting temples in the vicinity. Tay Ho Pagoda is exceedingly pretty and dedicated to the mother goddess and Trấn Quốc Pagoda is one of the oldest still-standing temples in Vietnam (although it has been rebuilt several times). For most travelers, West Lake is a great place to get a skyline view of new Hanoi, as well as to feast on fresh seafood at one of the many restaurants that sit close to the shore. West Lake lies off Thuy Khue Street. For anyone interested in what life must have been like for Hanoi's locals during an earlier age, a trip to Memorial House is a must-do while in the city. This finely-restored merchant house sits in the old town quarter and has been furnished to look like a typical merchant's home, brimming with antiques and everyday objects from centuries prior. The house has plenty of traditional architectural features, set between courtyards to give outdoor space and set out according to the ancient tradition of feng shui, which allows good energy flow into the house. In some of the rooms, you can watch traditional craftspeople in residence work at calligraphy and basketry crafts. Sofitel Legend Metropole Hanoi: colonial-style luxury, near opera house, multiple restaurants, sumptuous linens, beautiful garden, outdoor heated pool. Hanoi Emerald Waters Hotel Trendy: mid-range value, fantastic location, amazing staff, stylish rooms, breakfast included. Little Hanoi DX Hotel: affordable rates, elegant boutique hotel, friendly staff, fresh roses in rooms. Hanoi Holiday Center Hotel: budget hotel, exceptional staff, city center, modern rooms.